AKC Ch. 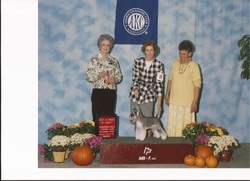 RMK's Ms. Kongeniality, "Gracie", is Rooster's 7th AKC champion to date. She was an excellent little girl and very fun to show.